No doubt about it. Many have been shocked by the election results. While there was a call for change, many are uncertain about what will evolve. Whether you are happy with the election choice or not, we know that disruption also breeds possibilities. When there is disruption—whether an acquisition, a change in the marketplace, a change in health or another challenge—there is an opening for doing things differently. Amidst the fear and concern with change, people are more willing to take risks and do things differently, especially when they experience the disruption as real. Strong leaders see the opening and make significant changes during difficult times. We can personally use the current disruption to reflect on how we want to interact going forward. 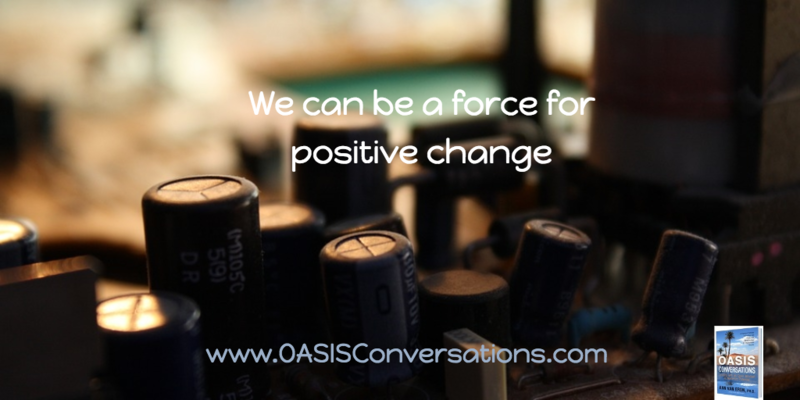 We can be a force for positive change by being calm and supporting dialogue, respect and openness. We can look for opportunities. At the same time, we can stay alert and speak up when we see a need. We can be curious about the different views and envision people coming together to address shared needs. We can recognize and manage our own concerns and encourage dialogue over polarization. We can look for how we can positively support and influence those in our circles of influence. I plan to help people to listen to different points of view and encourage an environment of respect. What is possible for you amidst the disruption?